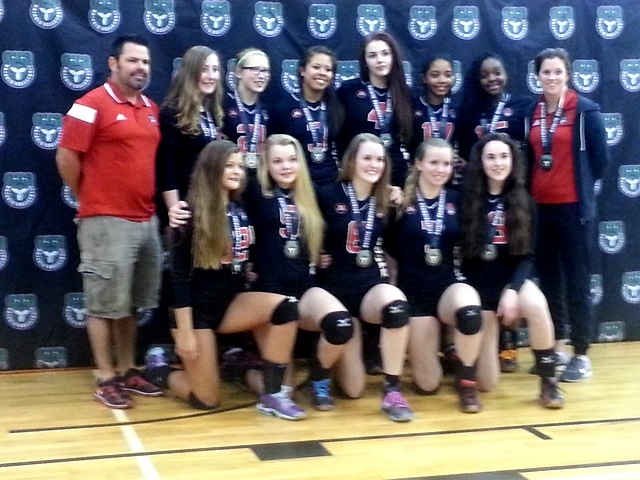 15U Girls Mighty Ninjas “Kick It” to take Silver at Ontario Championships!!! 15U Girls Mighty Ninjas headed to Provincials on April 10 in a great position, impressively seeded 3rd in the province. The Ninjas were full of excitement and a few butterflies – knowing they were well-prepared, strong and capable of beating any of the tough teams they would face, but knowing they had to do their very best this weekend and overcome any moments of losing their focus that had vexed them in some key games during the season. Day 1 was an early start at 8am, facing Oakville Thunder Blue. Oakville gave the Ninjas a good challenge, returning the Ninjas’ powerful serves and hits, and picking off points in the back corners, but the Ninjas pulled off the win in two straight sets, 25-18, 26-24. Game 2 vs. Etobicoke Titans Oceanus was a surprise. The Ninjas started both sets pulling way ahead, but Oceanus was having a hot day, and they caught up and took both sets 25-22, 25-23 (in part thanks to a huge serving run by a former DA teammate!). Game 3 vs. Ms. Pakmen was much better…the Ninjas were smiling, controlling tough balls and playing “their” game and had a satisfying and fun win 25-15, 25-18. Day 2 was another 8am start (no time for late partying the nights before!) vs. South County Teal. Ninjas started out strong and looked good, but lost their game a bit and South County took the first set 25-23. And then…one of those moments they dreaded… nothing went right in the second set for the Ninjas, giving it up 10-25. Nothing to do but shake it off…and they did – Ninjas showed up to face #1 seeded Aurora Storm Typhoon with smiles on their faces and big celebrations on every point they won. After a close fight in the first set, going to Typhoon 25-22, Ninjas showed their awesome skills and desire in thrilling rallies and took the second set 25-22!! So exciting! Typhoon wasn’t giving up though, and stepped up their game another notch in the 3rd for the win 15-8. Game 3 of the day was vs. the Ninjas’ old rivals Scarborough Titans Tektonics. With the confidence of a great game against Typhoon, Ninjas went in strong, and Tektonics did not put up the kind of fight they had in the past, conceding to the Ninjas in two straight sets 25-22, 25-19 – a huge boost and celebration for the Ninjas!! Day 3 Game 1 (again at 8am!) was vs. MVC Black. Ninjas were relaxed, serving great, full of spirit and big celebrating of points that showed their awesome power and skills, dominating the game for the win 25-12, 25-17. The next game was the key game of the championships…the quarter-final – either elimination or securing a spot in a medal match, facing the #2 seeded Forest City Green. The Mighty Ninjas were MIGHTY!!! They looked like the very best of themselves, played so tight, believed in themselves when any mistakes happened and recovered their game, and fought through the neck-and-neck 1st set for a thrilling win 27-25! Forest City could not get the edge back on the positive, confident momentum the Ninjas had going and the Ninjas pulled ahead towards the end of the 2nd set to take the win 25-21!! Awesome game!! The semi-final found the Ninjas facing the South County Teal team again…the very team they had crumbled against on Day 2. But this time the Ninjas showed South County an entirely different team – SO confident, positive, pumped, playing amazing, intense, fast, and with huge desire – and the Ninjas killed it in the first set 25-14!! South County fought back for a win in the 2nd set 25-22, but the Ninjas did not lose their desire and confidence and were ON FIRE in the 3rd set – dominating for the win 15-6 and securing their spot in the Gold Medal match!!!! No surprise, Ninjas faced Aurora Storm Typhoon for the Gold Medal. Ninjas knew they had it in them to beat Storm – they had done it earlier in the season – and went in hungry and confident. In the first set the Ninjas were full of smiles, strong, in control, and looking great – the set started out close, but the Ninjas pulled ahead and gained momentum and took the first set strongly 25-17!!! Typhoon was not giving up though, and the 2nd set was tight all the way. Ninjas played great, but Typhoon pulled ahead to take the 2nd set 25-23. After all they had left on the court, the Ninjas struggled to stay ahead in the 3rd set, conceding the short set to Typhoon 9-15. It was a thrilling game that could have gone either way, between two extremely skilled teams. Great to see two teams with a lot of respect for each other play such a close match – and nice to see some hugs between opponents and complimentary exchanges between parents at the end of such a hard fought battle! An Ontario Championships to be VERY proud of Mighty Ninjas!!! You did it – you capitalized on all your hard training, you showed the province your best play, you recovered when things went wrong, and you endured a very long weekend to achieve an excellent result – Division 1 Tier 1 Silver Medallists!! Congratulations & well done! Wish you all the best in Calgary. Finish Strong!